You use a whetstone, oilstone or waterstone to hone the edge on your kitchen knives, saw blades and other tools - but what do you use to take care of your sharpening stones? 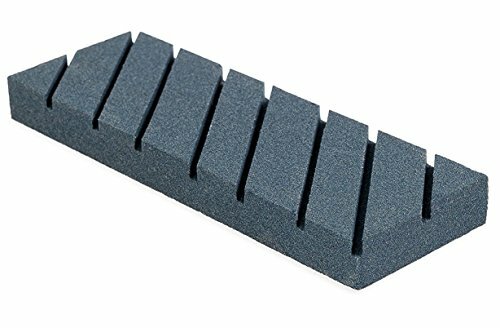 This Nordstrand flattening stone combines traditional techniques with modern Japanese manufacturing technologies create the perfect way to refresh your sharpening stones. Using this block, you can precisely level, flatten and refresh stone surfaces. This Nordstrand flattening stone is made from rough grit silicon carbide, which provides maximum peeling. The diagonal grooves channel waste away from the active surface. The large block is easy to hold and to use. At 8x2.8in (20.3x7cm) and 0.75in (2cm) thick it lets you treat most whetstones, oilstones and waterstones quickly and effectively. A simple way to make sure you've treated the whole surface of your sharpening stone is to draw a grid with a pencil on the stone. Wet with water or oil as appropriate, then rub with the flattening stone until all the marks have disappeared and the stone is level.